There are few things more frustrating than buying a toy that seems perfect for your child and then discovering it’s not up their alley at all. For parents of children with autism, this can be especially disappointing. A home behavior therapist with an advanced degree in Special Education has seen this scenario play out over the years, so she decided to fill the niche with Spectrum Toy Store, a Chicago toy store that caters to educators and families who are affected by autism. At Spectrum, children and parents are encouraged to try out the toys before purchasing them, so families can get hands-on reassurance that they are purchasing the best toys and resources for their child. Along with kid-friendly craft supplies, a huge selection of books, and puzzles, the store carries a variety of educational toys that will help kids practice and develop motor skills, life skills, and communication skills. In addition to the amazing array of toys and learning tools, the toy store also offers play-based group activities, camps, and therapeutic programming. Beyond the thoughtful details such as a carpet patterned with autism puzzle piece symbols, Spectrum’s most important asset in making the business a welcoming destination for families affected by autism is the store’s positive, inclusive attitude about the power of play in learning. For families who can’t make it to the Chicago store, check out Spectrum’s extensive online offerings. There are few things more frustrating than buying a toy that seems perfect for your child and then discovering it's not up their alley at all. For parents of children with autism, this can be especially disappointing. A home behavior therapist with an advanced degree in Special Education has seen this scenario play out over the years, so she decided to fill the niche with Spectrum Toy Store, a Chicago toy store that caters to educators and families who are affected by autism. �At Spectrum, children and parents are encouraged to try out the toys before purchasing them, so families can get hands-on reassurance that they are purchasing the best toys and resources for their child. 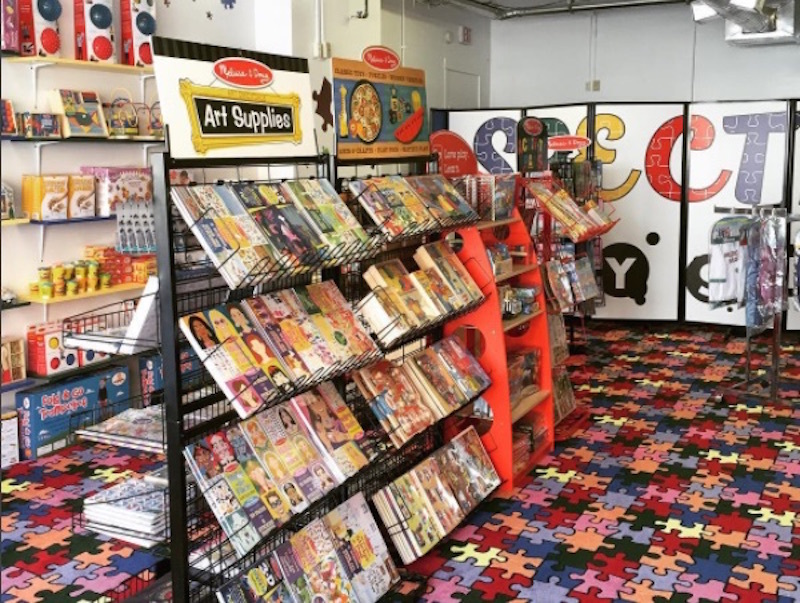 Along with kid-friendly craft supplies, a huge selection of books, and puzzles, the store carries a variety of educational toys that will help kids practice and develop motor skills, life skills, and communication skills. In addition to the amazing array of toys and learning tools, the toy store also offers play-based group activities, camps, and therapeutic programming. Beyond the thoughtful details such as a carpet patterned with autism puzzle piece symbols, Spectrum's most important asset in making the business a welcoming destination for families affected by autism is the store's positive, inclusive attitude about the power of play in learning. For families who can't make it to the Chicago store, check out Spectrum's extensive online offerings.